Welcome to the first episode of the d.science podcast! We have a video excerpt below, and the full 60 minute podcast is the audio link below. 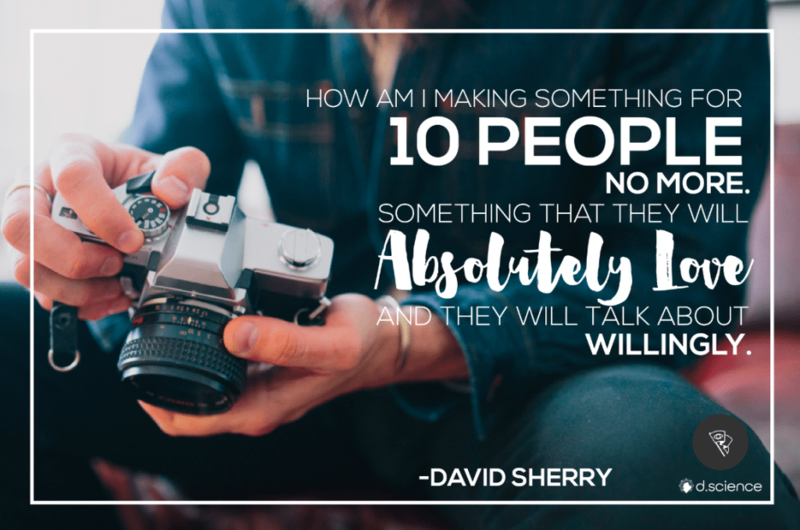 Enjoy the interview with David Sherry! In this session of the d.science Podcast, Austin + Emelina chat with David Sherry, a co-founder of Death to the Stock Photo who has created an incredible creative community of over 150,000 around smashing the mold with creative content and photography. Listen to the full podcast directly above. Austin and I (Emelina), had the absolute pleasure of interviewing David Sherry, co-founder of Death to the Stock Photo last week. Even if you do know this creative brand, hopefully we’ll be able to shed more light and insight for you! What is Death to the Stock Photo? For those of you who haven’t discovered this diamond in the rough… Death to the Stock Photo is a free and paid monthly subscription to artistically-crafted stock photography. They’re not your standard stock-photos. DTSP is here smashing the mold to inspire users to overcome their creative blocks, create often and create faster. Their photos are reminiscent of nostalgic hang-outs with your best friends. In one word, I would describe them as epic (but that’s just my humble opinion). Check them out and decide for yourself (we know you’re going to love them!). Why pay when it’s free? Well, premium members get double the amount of content and get constant access to the DTSP archives. Plus you would be supporting these amazing creators. My recommendation? Shell out the $15. You’ll be more than happy that you did! 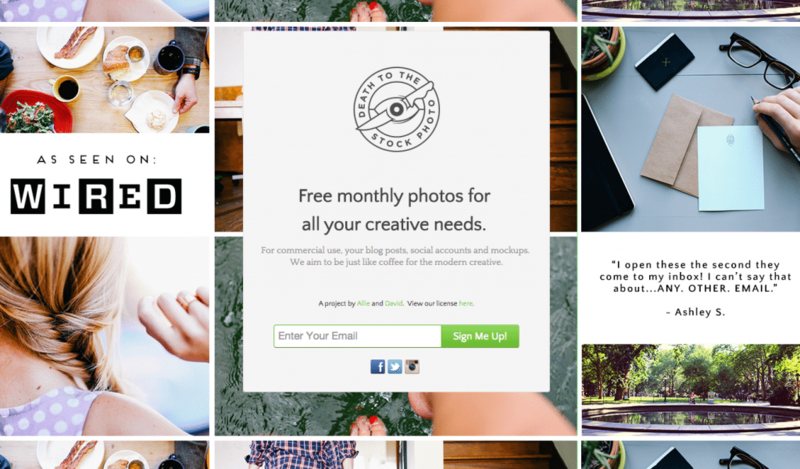 Plus, every month you get more photos than the free version. It’s like getting a care package in the real-people-mail. Seriously, I think I giggle out of excitement every time the email hits my inbox. And, I’m sure I’m not the only one! Who takes all the photos? In the beginning, the co-founders Allie and David took all the photos. More recently, they’ve expanded their network of photographers and wonderfully talented people. They wanted to help support other creatives while building a larger creative community and sharing stories that are more than just the founders. The best part about Allie and David is their drive and ultimate dedication to building and rallying a community. The story of Death to the Stock Photo began all the way back in 2013. And, the sweet, rebellious brand we know today was born. Allie and David jumped into DTSP with a solution in mind. What was the problem they were solving? With the emersion of social networks, brands needed to produce lots of visually intriguing content on demand (and most without photographers on hand). The DTSP founders then began to set up specific, days dedicated to creating photos for their new community. They drew upon themes that they thought would be helpful for businesses. In the DTSP archives, you’ll find photos themed for start-ups, health-nuts, creatives, artists, outdoors enthusiasts, travelers, coffee-shop lovers and more. Allie and David naturally just took photos of how they were living their lives and told stories that really mattered to them. How they built an email-list of over 150,000 people. David said they set up a simple landing page for the first 7 months. That was their web page. Want to see a little slice of DTSP nostalgia? Check it out here. This single page is responsible for tens of thousands of email subscribers. They started using Mailchimp for their email marketing. David said they are loyal to them because they’ve been with Mailchimp for so long! We asked David for specific advise for you guys reading this. What advice do you have for people looking to start and build a brand or blog? David really emphasized concentrating your efforts on your immediate customers and circle. When you start your brand, you’re small. His advice was not to discredit being small, but to really dive in and make the product for your crowd no matter the size. “How am I making something for 10 people? No more. [Something] that they will absolutely love and they will talk about willingly without my prompting. David actually spends Tuesdays and Thursdays reaching out to build personal one-on-one relationships with DTSP fans and clients. He does phone calls and Skype chats. They have thousands of users and David makes a point to build deep relationships with the community. David’s goal is just to connect with people and learn what they do, and who they are. He doesn’t really have an agenda, he’s just there to let them know that he’s always there for them. David has found that he receives valuable information and feedback about the DTSP brand and products around the way. Plus, it’s a great tactic to build your tribe. Additionally, David gets to meet tons of awesome, like-minded people. What’s the bonus in that? David and Allie take a road trip every year to take more photos for their followers. On the trips they get to hang out with their tribe, get coffee, adult juice-boxes, do pop-up art shows and most importantly—build friendships. We even met David the last time he stayed in NYC. We met up at the most hipster café I’ve ever seen, in Bushwick, Brooklyn. These guys are the real deal. This is the type of dedication and commitment that it takes to build a brand. How can you build deeper relationships with your community? Clear time out in your schedule, respond to comments on social media, and engage with your clients and your followers. 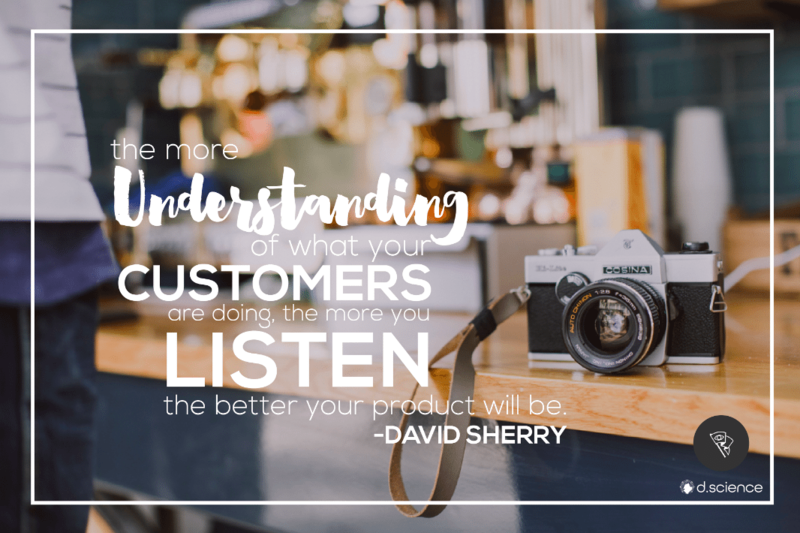 Listen instead of just talking to or at your customers. When you reach out to your customers and audience members, research what they’re doing. Take the time to learn about your audience members individually and check out their websites. It makes all the difference, and shows you really care. Not sure where to start? Austin and I have a free marketing pack dedicated to building your buyer persona and understanding your audience. David said that the DTSP brand collaborates as much as it can. Even though Allie is a phenomenal designer, they will team up with other designers like Brandon Rike for their new logo and Meg Robichaud for an icon set. Death to the Stock Photo also teams up with talented photographers to get you content that tells stories from all over the globe in the free and premium photo packs. “We’re always on the hunt for interesting creative people,” David said. Essentially, the more people you bring into your projects the larger the reach. And there can be a lot of crossover between audiences. It just makes sense. We loved the perspective David gave on entrepreneurship. He said understanding your fear on what’s stopping you is the best step you can take to move forward. David recommends the book Icarus Deception by author Seth Godin. Godin tells the story of Icarus who flew to close to the sun. The danger is not flying too high, but flying too low. When you know and understand you fear, and stare it right between the eyes, it doesn’t rule your life anymore. Fear is the anticipation of pain. It’s pretty much anxiety of things that are not real, and not happening in the future. If you have the courage to turn within and address your fears, you’ll be much more successful in building a business and brand. Austin goes into fear and failure in depth in his new audio book, the Inner Entrepreneur Bootcamp. He addresses how to discover that inner courage and re-framing your fears and failures to work in your favor. Exude the qualities that you’re representing in your brand. Be authentic, and put yourself out there. So what are you waiting for!? Get on out there! If you need some help starting to build your brand, pick up our free brand training (workbook and video). Like this article and the interview? Love the Death to the Stock Photo brand?